I encourage you to check out Jon’s website for info about him and his work. What I can tell you about Jon is that he is extremely talented, has a unique artistic vision, and is just an all around great guy. 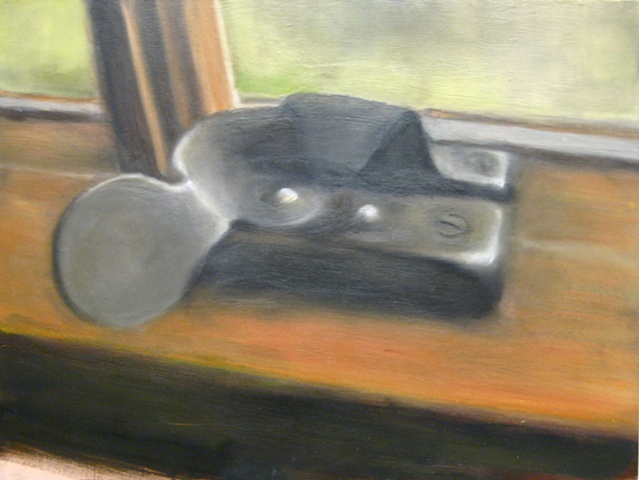 Jon works in a variety of mediums and is beyond proficient in them all. 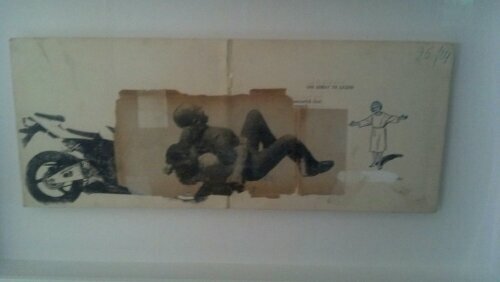 While I find his paintings and drawings to be appealing, it is his mixed media/collage work that I enjoy the most. In all of Jon’s work – and the more successful pieces by any artist – he pulls his inspiration from what he knows, whether it is family, work, or some other interest. My recent purchase of his piece, Of Course God, deals with the loss of his brother. We have all dealt with great loss – sadly some of those loses come way before we expect or are prepared for them. What is intriguing about Jon’s work is that why he references how his brother passed away, it is not the focus of his work. 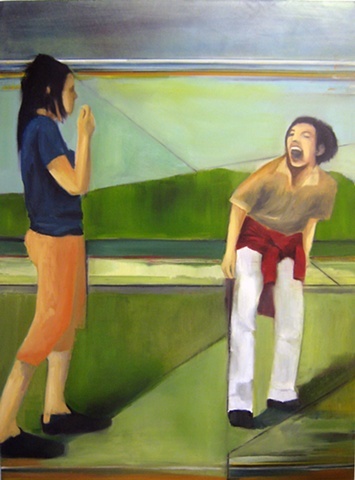 It’s an element for the viewer to see, but it is the action between siblings that is the focus. Those images speak to a vibrant life and to the dynamic between the brothers. While the image Jon shares (him and his brother wrestling) is very personal, I think all of us with siblings/relatives we are close to can identify with how the dynamics of age, experiences, and personalities play on our relationships. What I find the most moving – and comforting – is that Jon doesn’t appear to question why his brother is gone, but works towards acceptance and that some things can’t be explained or justified. The constant of Jon’s work – to me – is that it is very positive. Memories and how memories change over time are a focus of his, and his work captures those moments. What I appreciate the most is that the memories he works from are those “small” moments which turn out to be the most important over time. As one who teeters on the edge of being too negative, or, rather, gets too focused on the downside, it is inspiring to see work that shines in a positive light – strives for it at any rate. With a new chapter starting in Jon’s life, I look forward to see what direction he goes with his subject matter and media. Is this piece of art a new acquisition Staci? I like it a lot. Can’t wait to learn more about Jon. It is a recent acquisition of mine. I love it and can’t wait for you and D3Z to see it in person!